EasyMask® Masking Film Offers A Quick And Easy Way To Protect Windows And Door Trim To Prep For Painting. Makes painting easier, cleaner and faster. Choose from Standard or Premium masking film. Premium film is treated with a unique formula that not only attracts overspray but also reduces flaking. Sold in package quantities. 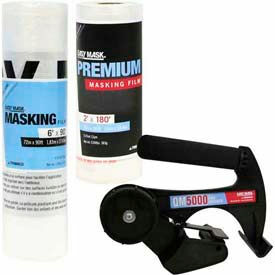 EasyMask® Hand Maskers help attach tape to the edges of either film or paper allowing a painter to easily mask off large areas. Replacement Paper Blades are sold separately. Polyethylene Window Protective Film Prevents Damage to Windows, Window Frames, Countertops and More. The water-based adhesive backing of this window film is easy to apply. 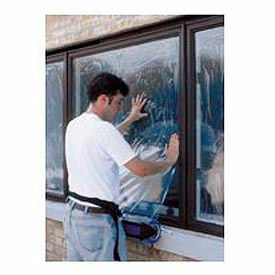 Safety window film is used protection from sprays, mortar and muriatic acid. This window glass film safely sticks to glass, painted surfaces, varnished surfaces, shellacked surfaces and more. Allows light in, making it easier to work in the room while protecting your windows. Removes in seconds for easy cleanup.